There's no doubt many employees and passengers will feel nostalgic when Istanbul's Atatürk International Airport ceases commercial operations in the new year, but one man, who has called the global aviation hub his home for the last 27 years, indeed stands out from the crowd. Bayram Tepeli left his hometown of Gemlik in northwestern Bursa province at the age of 26 due to "problems" with his family and arrived in Istanbul in 1991. He found work at a cleaning company and began staying at a hotel in Kartal district. Later, his boss directed him to find work in Atatürk Airport, where he worked for a short while but has lived ever since, as he had nowhere to stay. "My former boss told me one day that he found me a job where I wouldn't need to find a place to stay anymore. Then, I came here," he recounts about his early days at the airport. He spent the rest of his life at the airport until he was forced to quit a decade ago due to health problems. With nowhere else to go, he decided to continue staying in the airport's terminal. Tepeli is often likened to Iranian Mehran Karimi Nasseri, who gained international fame with the movie "Terminal," telling his 18 years as an asylum seeker stuck in Charles de Gaulle Airport in Paris. Tepeli said he only left the airport for a brief period last year for treatment at a hospital in the northern province of Samsun and visited his family for three to five months this year. 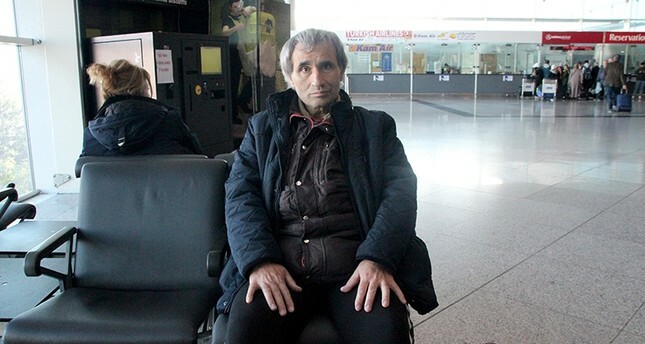 He doesn't have money to find a home outside, but he is grateful to airport staff, from civil servants to shopkeepers and police officers who never left him "hungry and alone." "Those who know me closely have been very helpful. May God bless them all," Tepeli said, adding that he has unforgettable memories with the airport staff. Tepeli has never been to new Istanbul Airport but saw it on TV. He is sad that he will leave the airport after the transfer of operations slated for the New Year's Eve but praised the new airport he describes as "big and modern." Atatürk Airport will be reduced to a flight hub mainly for cargo planes and a section of its land will be allocated for construction of a large park, as per government plans. "I don't know what will happen now but I rely on my fate. If the authorities can give me a place here, it would be great. Atatürk Airport is my home, and I will miss it much when it is closed," he said. "He (Tepeli) had no problems when he was younger, he was able to live through. Now he has a scar on his foot and he is trying to deal with it," Demirel said, adding that he wishes for authorities to be interested in his plight.